In a poll released Monday, 47 per cent of respondents said Canada is taking in the right number of refugees, while 41 per cent said the number is already too high. Only 11 per cent of the 1,508 adults surveyed said the country should increase the number of refugees coming to Canada. Now, there are a number of ways that statistics like this can be reported on. In the case of the Globe and Mail, instead of saying that 58 per cent of Canadians are glad to see refugees here, and that one out of five of these Canadians want us to accept more, the Globe thinks the significant part of the survey is what it describes as the sizable minority -- 41 per cent -- who don't want more refugees coming in. Why does this emphasis bother me? Because this is the type of news story that was framed according to someone's stereotype -- lets find some anti-refugee Canadians, there must be lots out there! -- while also pandering to a big-C Conservative view -- that Canada already accepts "too many" refugees. Lets everyone fight! Never forget, it was the Harper Conservatives who tried to destroy Canadian compassion by cutting off medical care for refugees, by talking about "barbaric cultural practices" during the election, by inflating controversies about hijab-wearing Muslim women, etc. Harper is gone but his Conservative allies -- big C and small c -- are still with us, still fomenting divisiveness and suspicion between Canadians. Canada now is accepting the tired, the poor, the wretched refuse, the huddled masses yearning to breathe free. And isn’t it great that we can do this. I know there are inevitably some Canadians who will be “outraged” about the refugee stories we are now hearing about along the world’s longest undefended border. I’m so glad we elected the Trudeau Liberals 15 months ago; I hope public safety minister Ralph Goodale will continue to stand firm on Canada’s right to continue to treat refugees fairly. These photos are from a CBC story yesterday on refugees crossing illegally from the United States. 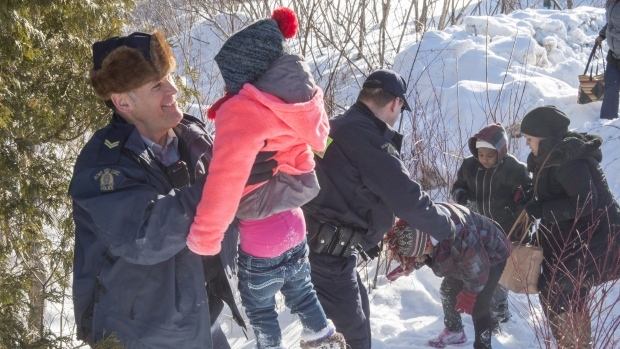 They show RCMP helping the family of nine Sudanese people across a snowbank at the border, after running from US border guards. As the CBC story notes, asylum seekers who cross illegally are arrested but they can remain in Canada while their refugee claim is assessed. If they try to claim refugee status at a regular border crossing, the so-called Safe Third Party agreement between Canada and the US means they are turned back immediately into the United States. And in the United States, their future is now bleak. [Montreal immigration lawyer] Taillefer says there are many practical reasons refugees are choosing to come to Canada instead of staying in the U.S.
For one, they are entitled to legal aid in Canada and welfare while they wait for a hearing, which is supposed to happen within 45 days of their arrival. When they first come to Montreal, the YMCA provides food and shelter, but also help accessing social services, as well as finding an apartment and work. In comparison, refugee claimants can wait two or three years for a hearing in the U.S., and their legal costs can reach as high as $15,000. In the meantime, they can’t get a work visa, and welfare is all but non-existent south of the border, Taillefer added. “I had clients who said they were living off soup kitchens and when they saw that their files would be treated in 45 days and they could get legal aid in Canada it made a big difference,” Taillefer said. 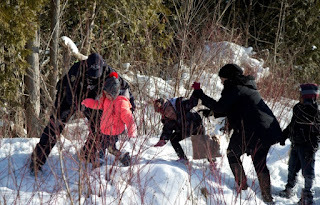 Those factors may have contributed to the massive increase last year in the number of refugee claims made at land borders in Canada, despite the Safe Third Country Agreement — up more than 60 per cent across the country, from 4,316 in 2015 to 7,021 in 2016. Then there’s Trump — and the state of the world. “Since November we’ve heard more and more about Trump’s politics but also of the attitude of Americans in general toward refugees (during the election campaign),” Taillefer said. People who had legal status as refugee claimants or students started to say that even if they were accepted by the authorities the population would still see them in a negative light, he said. And here is a recent CBC report — reporter Nick Purden interviewed a Somali man in Winnipeg who had crossed in November after 12 hours walking, and had gained refugee status. Then Purden drove to the border that night, February 12, and found another Somali refugee who had walked for 21 hours to cross the border. The man didn’t realize he had already made it to Canada, and he needed repeated reassurance that the RCMP constable who arrested him was not an American border guard. UPDATE: So some federal Conservative politicians are against the new refugees and want RCMP to turn them back to the States. Michelle Rempel and Tony Clement have tweeted that illegal crossings are unsafe and place a burden on local law enforcement. Yeah, like the RCMP in southern Manitoba and Quebec would be chasing down international drug traffickers if they didn't have to rescue a few dozen refugees. Not to say this isn't going to develop into a significant problem pretty rapidly. But of course the answer is to suspend the Safe Third-Party agreement so that these desperate people can ask for refugee status at regular border crossings instead of having to cross illegally. Canada should do this right away, before Trump's new executive order is promulgated. And before someone freezes to death. Bannon for the white supremacists. Pence for the religious right. Priebus for the Tea Party. As far as I can tell, those three pillars are holding strong. And the fourth pillar--Wall Street— is reflected in his Cabinet. It's also holding, but may be the weakest link. Both very insightful, I thought. Regardless of what they may have thought they were doing, in firing on innocent worshippers the gunmen were firing at all of us. And therefore it is incumbent on all to show solidarity in the face of this horror. In due course, the accused gunmen will have to answer in court for their actions. In the meantime, the unity of our condemnation must be the only response to these repugnant actions. Trudeau immediately called it a terrorist attack -- there was no dithering about this at all. Initial reports blamed two shooters, one of whom was apparently Muslim. Right wingers seem to think it couldn't really be terrorism if a shooter was Muslim -- I read many right-wing tweets about this, which I will not embed here. Montreal Simon is rounding up the appalling right-wing reaction to the Quebec City Massacre. It is just tragic what is happening in the United States today. Canada needs to step up to the plate and accept the refugees, US green card holders, dual passport holders, prospective immigrants and everyone else that the United States is now turning away. Sorry Frank, but I'm glad to see the last of 2016.